My brother William (Bill) Arm and I were born on April 28, 1930 in a small town (shtetl) in eastern Poland. We were premature, identical twins. At that time our survival was considered a minor miracle. Our mother, Sara (Spatz) died at childbirth, which was not unusual at that time. Our family was relatively prosperous so we received good care - a wet nurse was hired to provide the required nutrition as well as motherly care, supplemented by several aunts on our mother’s side as well as our father (Isaac) and grandfather (Marcus) who provided moral, religious and educational guidance. Father was a teacher of the Hebrew language (modern as spoken in Israel) as well as businessman. He was a well-educated man in worldly matters as well as in the Torah. He refused to remarry one of mother’s sisters: he felt that he did not want his children to be raised by a stepmother. The wet nurse was a Ukrainian teenage girl, Katie, who stayed with us until the start of the war in 1939 (World War 2 invasion of Poland at that time). However, everything changed after the start of the war in September 1939. German troops overran Poland (their first practice of blitzkrieg) very fast and occupied our town of Dynow within a couple of days. We were then 9 years old so that was a most striking, exacting and unforgettable event in our young lives. We were suddenly turned from children to adults. Our house, where most of our family lived, was located on the main square of the (Rynek) where all the important activities took place. This included the weekly market, all national celebrations and events. It was also where the German troops entered the town. Most of the family including my brother and I were watching the event from a circular window overlooking the square (Rynek). Several German soldiers became visible, approaching and staying close to a building wall to minimize themselves as exposed targets. They moved slowly with their rifles ready. However there was no organized opposition but a lone Polish soldier with a rifle standing in a building doorway. We heard the German soldier shout the order “Hander Hoch” but the soldier probably did not understand - he raised his arms but still held the rifle in his right hand. The German soldier raised his rifle to his right shoulder and fired. The soldier’s rifle dropped to the ground, as did the soldier, clutching his arm. Thus the town of Dynow fell to the superior force of Germany. The German troops established camp right on the square where we lived. As children this was a new and exciting event. The soldiers were friendly and generous with candy and other goodies. These soldiers were part of the Overmach - ordinary conventional army soldiers. Within a week all the soldiers and their trucks left. Then the next day (which was Rosh Hashanah) a number of black covered trucks arrived: that was the Gestapo Hitler’s special troops — everything changed dramatically. Almost immediately they proceeded to round up most of the Jews of the town, which was facilitated by the fact that most of them were in the synagogues since it was Rosh Hashanah. That night the captive Jews were loaded onto trucks and taken outside the town to a wooded area close to the old Jewish Cemetery [Zurawiec Forest]. There the German Gestapo had several machine guns on trucks. The victims were lined up and executed by the machine guns mounted on trucks. That night more than 600 Jewish men lost their lives. We know exactly what happened because as impossible as it seems there were four survivors. Several of the intended victims were wounded but not killed and thus had the chance to crawl away during the transfer of new victims. This was the beginning of the holocaust; but the Nazis had not yet perfected their efficient methods of mass killing of innocent Jews. We were lucky that none of our immediate family were victims of that horrible night. However, in the Jewish community of Dynow almost everybody was related in some distant way. About 2 weeks later notices were posted all over town ordering all Jews including women and children to assemble on the main square (Rynek) of the town. By that time our father was somewhere in hiding, but not my grandfather. He posted a sign on the front door of our building stating that the door is locked and the key is lost. The house could be entered only by the back door located in the back alley away from Rink. That worked to the extent that the Gestapo forces were located right at the main entrance to our house. None of them entered our house. As directed, my brother and I joined other members of the family at the assembly in Rink. The group consisted of perhaps 300 people, mostly women, children and elderly men. That afternoon we were forcibly led to the river San, about 2 km east of town. In this activity the Germans were assisted by Ukrainian men who were German sympathizers and were know for their hatred of Jews, who in turn were hated by the Poles. Thee we loaded onto a ferry and taken across the river San to a village called Dubovka. There my family knew some of the inhabitants who took us in to provide food and shelter. Several younger men who showed some displeasure were forced to wade across the river and rounds were fired in their direction to urge them on. I believe that all of them made it across. By that time Hitler (Ribbentrop) and Stalin (Molotov) agreed to divide Poland between themselves with the river San becoming the border. Eventually we were joined there by most members of the family. From there we all moved to Przemysl, which was a major city on the river San. Of course we all moved to the Russian side. There our life returned to relative normalcy. We attended school, renewed old friendships and explored the city of Przemysl. It is an old historic Polish city with medieval castles, museums, etc. The school we attended was a Jewish school where all subjects were taught in Yiddish. In addition subjects in Jewish and Polish history and also an introduction to Russian. Until this time our daily language was Polish. We did however have a passive knowledge of Yiddish, which was spoken, by most of our relatives including our grandparents and many other relatives. 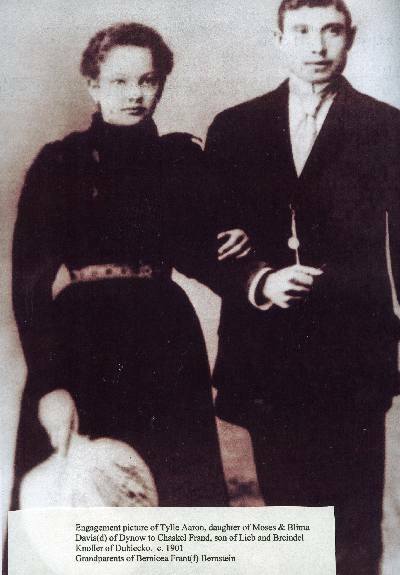 We lived in a rented apartment with our grandfather and his second wife Hanna (sister of his first wife). Also in the same house lived my father’s sister Surra with her husband Efroim and their three children: Pincas, Mechal and Ethel.Again this relative normalcy was suddenly interrupted one night by a knocking at our door. Several Russian soldiers appeared. We were given 10 minutes to get dressed and pack our belongings. Father was not with us at this time. We were with our grandfather, who was bedridden and Hannah, his wife. So my brother and I and Hannah were loaded onto a truck waiting outside. Grandfather was left alone in the apartment. Other members of our family, namely Surra and her family who lived in the same house were not detected. Once loaded the truck was driven to the city railroad station where a train consisting of many freight cars was waiting for us. The interior of a freight car consisted of the following: the center portion, about one third of the length of the car contained the sliding door on both sides and about a five inch circular hole in the floor which was the toilet. On each side were shelves separated by about 3 ft. inch high, which were for sleeping. In the morning the train started moving east and under way adding more cars at various stations. By the time we crossed the Russian border there were more than 100 cars. In the next couple of days, when Father discovered what had happened, he proceeded to chase the train and caught up with us before we crossed the Russian border. The train was parked in the station assembly area waiting for the locomotive to continue the trip. The doors were locked and there were no guards in sight. Once he found the train and located the car where we were located, he managed to climb up to the window and crawled in. Thus we were reunited with our Father. After crossing the Russian border doors and windows were left open by the guards since there was no place to go. In Russian, without papers one could not travel anywhere. The train stopped often at various stations. There women were selling all kinds of prepared foods which we could purchase for cash, valuables such as clothing items and; of course gold or jewelry. We remained on that train for 20 days covering a distance of more than 20,000 miles from Przemysl. On the way we passed and visited many major cities. This included Minsk, Smolensk, Kiev, Moscow, Kazan, UIfa, Omsk, Novosibirsk and Tomsk, our final destination on the train. Then we were transported by trucks to our final destination, which was a giant lumberyard in the village of Cheremosniki outside the city of Tomsk in the region of Novosibirsk in southeast Russian Siberia. The lumberyard was located on the banks of the river Tom, a tributary of a major river Ob, which flows north from the Tian Shan Mountains to the Taiga and the Kara Sea. Thus lumber was cut in northern Russian Toga (by other prisoners), is floated down the rivers Ob and Tom (more than 1000 km) and then downloaded at the Cheremosniki to be cut and processed into construction wood and other materials. We were the new contingent of labor power to perform that task. The size of this camp was enormous; approximately 20 x 5 km; the closest city was Tomsk, near the major Siberian city of Novosibirsk (some 8,000 miles away from Poland, a world as strange as the moon). The temperature there ranged from a balmy 70 degrees to a bone chilling minus 40 degrees in the winter. The able men among us provided the required labor force to run this hug facility. Father, being an educated person, was assigned to maintain accounts for the entire camp. My brother and I, plus another girl attended school in Cheremosniki. We had to walk to school every morning, about 5 km. sometimes in temperatures of minus 45 degrees. They did provide us appropriate clothing and valenki (boots made of wool) perfect for the conditions. We had a wonderful and dedicated teacher, Vera Petrovna, who was not only a most effective teacher, but also brought us bread from her own rations. In a short period she introduced us to the Russian language, Russian culture and literature. From there in 1941, when Hitler attached the Soviet Union, we were included in the armistice agreement with Gen. Sikorsky who formed a Polish Legion in the USSR to fight the Nazis. As part of this agreement we were freed and were free to leave Siberia. So naturally we chose to go to a warmer climate. Most people shoes Tashkent, but Father decided to go to Kirgizstan (middle Asia) instead which was a very wise decision since Tashkent became overcrowded by refugees from the Ukraine and other German occupied areas, suffering a series of typhoid epidemics where many of the people perished either from disease or starvation. We settled the first on a collective farm near Bilovotsk but then in a few months we moved to the adjoining town of Bilovotsk. We actually bought part of a mud house consisting of 2 rooms, an entry foyer and a pig stall. The houses there were built almost entirely from mud mixed with straw. This provided some tensile strength to the mud structure. Very little wood was used since it was very expensive; none of it grew in the area. While on the collective farm I established a friendship with a Ukrainian family who were also displaced people who were brought there some ten years before. They, as we, were forcibly brought there by the Communist regime. This was a practice widely used. The communists inherited it from the Czars. Any group whose loyalty was considered questionable and thus a possible threat to the regime were simply picked up and transferred to another location like Siberia, usually a long distance away from their home. Not only were they no longer a threat but provided cheap labor. In fact a major portion of population of major Siberian cities consists of people whose ancestors came there as political prisoners. The man of the family was a kind of shoemaker among other things he did to take care of his family. They had no children so he kind of adopted me. From him I learned the rudimentary skills of shoe making. From there I went to work for a real shoemaker, Maxim. I actually lived in his house for several months and did most of the work while he had all the time he needed to get drunk and beat his wife. I thus became a real shoemaker. There over a period of 3 years we learned and practiced various trades: shoemaking, tailor, hat maker and sold these products on the Bazaar where to a large extent the local as well as the regional commerce and economy were conducted. We eventually bought (on the bazaar) sewing machines and all the necessary tools to manufacture shoes, hats, etc. In the area where we lived there were a number of families with similar backgrounds. In addition there was a large contingent of Jewish people from the eastern part of USSR who moved there to escape the German occupiers of the USSR. In 1944 when the war in Europe was coming to an end we proceeded to travel west away from Russia toward Europe and Poland. That trip took nearly a year since there were no regular trains. You just took whatever train was available going in the general direction, and thus we saw a substantial part of Russia. On the way we spent 3 months in Moscow living in a Jewish community in Pushkino just outside of Moscow. We visited all the great museums as well as the Bolshoi (Eugene Onegin, Tchaikovsky). This was our first experience to see live performances of a grand opera. On our way we visited many cities, one where we spent several months and left a deep impression was Chenoweth, located in eastern part of Rumania (Bukovina), which was once part of the Austrian Empire. This city was known as a Jewish cultural center, which included a Jewish University High School and Theater. The Jews of Rumania largely survived the war because the Rumanians refused to surrender their Jews to Germans, instead keeping them in their own camps. By the way that was where Pop met Lucy. Eventually they were married in 1949. That is a separate story. Her experience during that period is quite different from ours and deserves a separate chapter. Suffice it say here, she and Pop came to this country about a year after we did. They eventually lived in Flemington, NJ where Pop owned a chicken (egg laying type) farm starting with some 650 birds winding up with more than 20,000 on several farms when he retired and moved to Fort Lee, NJ. Pop passed away in 1984 and Lucy in 2009 at the ripe old age of 99. This was the second opportunity to resume our formal education since the war started. The first was Cheremosniki where we attended a Russian school and learned Russian and were introduced to Russian literature— Pushkin, Tolstoy, Dostoyevsky, Lermontov and of course Gorki, the Soviet favorite. We eventually wound up in a Displaced Persons camp outside of Munich, which was run and supported by American funds. (There I met Mayor LaGuardia — quite a personality). We soon discovered that we were the only remaining members of our entire family consisting of more than 30 before the war. We discovered later that Itka, our cousin was another survivor of no less than Auschwitz concentration camp. We wanted to leave Germany as soon as possible. The first opportunity that presented was to go to the USA through HIAS as orphans. We jumped on it and a month later we sailed past the Stature of Liberty into NY harbor. Perhaps that was the most important and fortunate event for both Bill and me. When we came to this country we received tremendous assistance and help from various people, especially people from Dynover Society who of course knew our family and were always ready and eager to help. Especially I want to acknowledge Jack Ores (then the president of the society), his wife Cirri (who always had dinner ready) and their daughter and son. There were many others who provided the sympathy, understanding and advice; important aid to newcomers to this great country. We became quickly established: we both graduated from High School and proceeded to College. We lived in a rented apartment in Flatbush, Brooklyn. We attended Brooklyn College at night and worked during the day. Bill worked in the shoe industry and I in the garment industry. I became a member of the Garment Workers of America Union (Dubinsky was President). I worked in the same shop for more than 2 years and became a member of the shop committee. I was making sufficient money so that I could devote enough time and effort to my education. We both became US citizens in 1953 while members of the US Army. A great day for both of us. We were both actually drafted into the US Army in 1953, after several educational deferments. We received our basic training at Fort Dix, NJ in a Heavy Weapons company. Most of the company was shipped to Korea where many gave their lives. My brother and I were assigned to Trieste, Italy to a Signal Corp. Co. (someone discovered our education in electrical engineering). We served there about 18 months and returned back in 1953. We then resumed our education. Bill was briefly married in 1958. Although the marriage was less than successful, it did produce a wonderful son - David. David is now married to a beautiful young woman, Meredith. Unfortunately my brother did not have a life as happy and fulfilling as it could have been. His involvement with the wrong people, especially women was the primal cause. He became a devoted and highly skilled bridge player but devoted enormous energy and time to it, unfortunately to the detriment of other family activities. It pins me that even at his death some of the people who could have given him some measure of happiness but failed to do so. We moved to an apartment on 114th St. across the street from Columbia University and resumed our education at City College of New York, I in electrical engineering and Bill in chemistry. The funds we received on the GI bill were sufficient to cover our expenses so for the first time we were full time students. We graduated in 1956. I went on to Columbia University and accepted position with the Electronic Research Lab of Columbia University. Bill had several positions but eventually settled with Loral Electronics. He was with them for over 30 years when he retired in 1995. I continued with Electronic Research Lab, which became an independent institute known as RRI (Riverside Research Institute). My first ten years were devoted to research of electro- optical processing, a relatively new field of developing new techniques for large radar signal processing. This was eventually solved by the development of large-scale integrated digital circuitry. I continued work in the missile defense area specifically discrimination of decoys from warhead. I spent 5 years in El Paso, Texas where I directed the Amrad radar facility used to experimental verification and study of discrimination technical effectiveness. I retired from RRI in 1992 after nearly 40 years. My personal life has been largely fulfilled. I have two daughters, Sara and Karen. They are both married to wonderful and fulfillment. I am married to my second wife Betty going on over 30 years. We have a good and secure life together and the resources and friends to enjoy life. The shining jewels in our lives are our grandchildren. We have two young men and three beautiful young women. On my side Adam and Jessica Gallob and on Betty’s side Rachel and David Saxon and Emily Robin. They are everything and more than anyone could wish for in grandchildren. The joy of our lives! I believe that we are the product of both our genes and inheritance, but perhaps more important the life events and experiences that we face, especially in difficult and challenging times, and the actions we take to resolve them in order not only to survive but achieve fulfillment and satisfaction. Jerry Liboff* and I had spoken many times about returning to the shtetls of our parents, Dynow and Dubiecko but we never made any definitive plans. I was speaking to Sharon Brooks* one day, when she mentioned that she had been invited to Poland to evaluate the para-olimpics..... I immediately said, "I'm going with you and I am going to call Jerry in Alaska and ask him he wants to join us".... And so it was that we were on our way to Poland. In the evening we ate at one of the outdoor cafes, which was in the square near our apartment. People eat late there and maybe because of the heat there were many people walking around. This morning we walked to the main campus of the Warsaw University to tour the Chopin Museum. It was formerly the Czapski Palace now home of the Academy of Fine Arts. The building was the last home of Chopin before he went into exile. The second floor has period lithographs and furniture recreating the Chopin Family Salon. June 19, 2006-WARSAW-We proceeded to the "Blinkie" Bakery. It is the oldest bakery in Warsaw opening in 1869. We had been told that the baked goods were the best and we were not disappointed ordering cheese Danish and coffee. From there we hopped on a bus and rode it to the end of the line which was quite a ways out of the city. It was here that we were able to view the grandiose palace of King Stanislaw. Hotel Polski was an elegant hotel prior to WW II. Our room was straight out of an old movie. Upon entering there was a large vestibule with an armoir and large mirror. The bathroom was to the right, tiled, with a very large tub just like the one in our Warsaw apartment. In order to take a shower, you sat on a cut out seat in the tub and washed with the hand shower. The room itself had high ceilings, windows from ceiling to floor and no air conditioning. The hotel did have internet which was free in the lobby. We all took advantage of it. Believe it or not there were two Jewish kosher restaurants in the square. One was the former mikvah and now called the Klezmer Hois. I think they have Klezmer music there also. Jerry, Henrik and I ordered gefilite fish which was delicious-just like my mother use to make...After leaving the restaurant we proceeded to Schindler's factory. Today we are off to the shtetls Dynow where the Aaron family came from and than to Dubiecko where the Frands lived. Tillie Aaron daughter of Moses Aaron married Chaskel Frand from Dubiecko and moved there shortly after their marriage. We finally arrived in Dynow on a two lane road which kept curving around. Upon entering the shtetl the first thing we saw was a farmer on a horse and wagon. Wow, this looks like it did when our family lived there but changed as we entered the town, there were many cars. The first stop was the cemetery. The cemetery was surrounded by an iron and brick fence. Perhaps, sewer pipes were being installed but there was an open ditch surrounding the cemetery. We looked at the gate, which was locked, started walking around to find out how we were going to get into the cemetery, when a woman came running across the road with a key and opened the gate. She than directed us to follow her. The grounds were overgrown with weeds several feet high. No gravestones were to be seen as the Germans had ground the gravestones up for roads. Prior to WW II Dynow had only dirt roads. We followed the woman, who only spoke Polish. Due to the fact that there were no paths, we walked through high weeds about two to three feet high with the ground being uneven. We followed her to a concrete building which held four gravestones. Above the gravestones were plaques in Hebrew and pieces of paper with lists of Dynow people who had been killed in the holocaust. All of this was reconstructed after WW II. Sharon and Jerry proceeded to the other building which had another gravestone. It was sad to think that we had come to our ancestors cemetery and not able to pay homage to them. Fortunately, I have a picture of my grandmother, Feige Aaron's (Aron, Arm) gravestone. We rode to the main square. It, too, was under construction. Henrik parked the car and we walked around the square taking pictures. There was a little kiosk where I was able to buy postcards. In looking back at old pictures of Dynow, the kiosk looked like it had once housed a Jewish store. The buildings around the square were once occupied by Jewish business men. It was noontime. Young people were sitting in the Square and children were practicing which looked like cheerleading but could have been a dance on a high platform. My mother use to tell me that there was a well in the middle of the square where she would go for water. All we saw was a statue of a small brown bear with water shooting out of it. Perhaps this is where the well had been. It was hot and we were thirsty so Sharon and I went into the small grocery store and bought bottles of water. In front of the store was a white plastic table and two white plastic chairs. (Just like the ones in the United States). As we started drinking out of the bottles, the grocery man came out of the store with plastic cups. I thought that was a nice gesture or maybe Polish people do not drink water directly out of bottles. After cooling off, Sharon and I walked over to the bibliotheca, which formerly was one of the synagogues in Dynow. It housed a torah in a glass case. Looking at it, Sharon immediately noticed that it was upside down and had the librarian open the case to turn it around. In the meantime, Jerry was walking around videotaping the town. I wish we had more time to spend there but we had appointments in Dubiecko and had to leave. Once again, as drove along we began to see signs DUBIECKO and of course we were excited nearing another shtetl of our ancestors. We were finally going to visit the shtetl of the Frands. Dynow and Dubiecko were known as sister shtetls. The drive was about a half hour away. I don't know why they were known as such perhaps, many people from each shtetl had relatives. Arriving at Dubiecko we went to pick up a key to the cemetery gate. 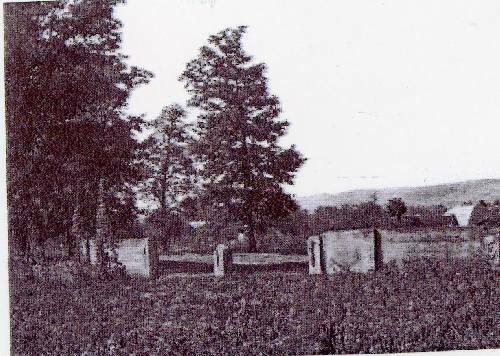 This cemetery had also been destroyed by the Nazis for the same purpose as in Dynow. The wall here was also new. Money was raised for it by Dubietzkers. It was a concrete wall, unlike the iron and brick wall surrounding the cemetery in Dynow. 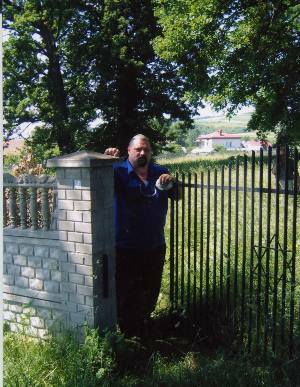 The photograph on the right shows Henrik, our driver, standing at the gate to the Dubiecko Cemetery june 2006"
Again the weeds were two-three feet high. In the middle of the cemetery there were two large trees several hundred feet apart. We were told that the Nazis had taken 700 Jewish people from Dubiecko and shot them between these two trees. They were buried in a mass grave. father's brother had been killed in Dubiecko during WW II and we were hoping that his name was listed. At least we would have known what happen to him even though he was buried in a a mass grave. We never could find the list. Our next stop was the shtetl itself. We had a picture of my grandmother, Tillie, taken with two of her sons, Milton and Schmuel, (he was the one killed in the holocaust) and a daughter, Elaine, in front of an elementary school. We asked a policeman where the school was. We were directed to a school which did not look like the one in the picture. Prior to coming to Dubiecko, Sharon had been in contact with Professor Norman Bertram, from New York and Richard Tomer, from Israel. These two gentlemen had made appointments for us to visit two families in the shtetl...We were invited to a lovely couple's home Mr.and Mrs. Szybiak. He was an anthropologist, did not speak English, and she was a high school English teacher. They had many interesting artifacts in their home. They were very hospital and gracious. A registration book of children registered in the third grade from 1925 to 1932 was shown to us. Knowing that we were coming, they had asked for our family name and gone through the book and clipped all the pages of the Frands. It was very exciting seeing our family names written in this book. ...This couple, with several other interested people in town (Pop. 1000), had converted an abandoned ]Russian Orthodox Church into a cultural center [at left]. 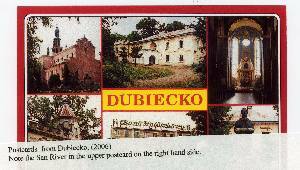 My father use to tell me of the nobleman and his family who came to Dubiecko for the summers. He would hire my great grandfather and his klezmer band to play for them on weekends when they had company. The band was composed of all his children including my grandfather, who played the violin. was like a picture one would see in your history books or Disneyland. The San River runs through Dynow and Dubiecko. It is not a very wide river. Our families used to wash clothes and go swimming or perhaps bathe in the river...I was amazed at how clear the water was..
talking about how glad we had made the trip. Given the opportunity again, we would like to go back for a week to the shtetls and to the Przemysl Archives. 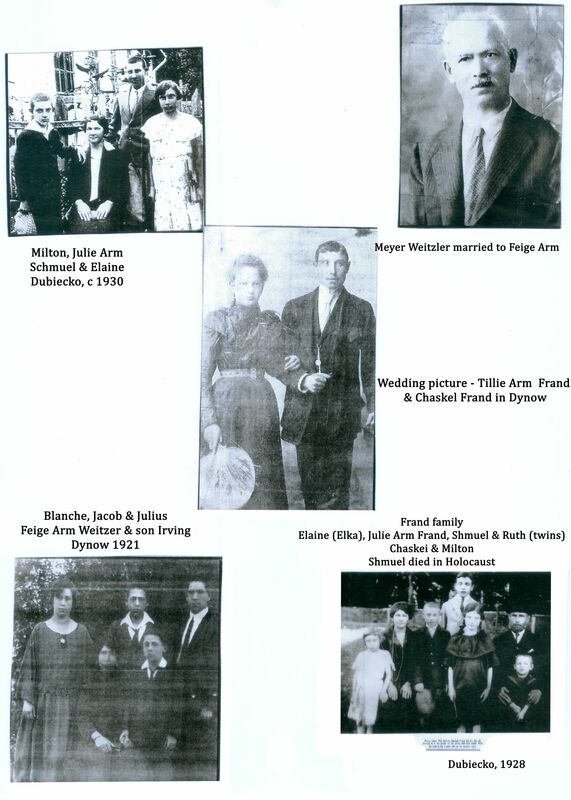 July 2006- My cousins, Bernice Bernstein and Jerry Liboff return to the town of our parents, siblings all – Dubiecko. My cousin Bernice wrote already about that then. Could anything have changed from then until now in terms of the Jewish presence in Dubiecko? Well- yes and no. No Jews have returned to Dubiecko to live. The cemetery perimeter wall which replaced the missing original one thanks to the efforts of Professor Norman Bertram remains in place and has even had recent damages repaired. No stones are in the cemetery, however, two partial stones from the Jewish cemetery are, in fact, in Dubiecko, at the home of the local historians, Agnieska and Robert Sziviak. The tall grass and overgrowth that were present last year were still there, but are no longer. I have made arrangements with the cemetery groundskeeper to support the cemetery; I am working on a way to coordinate this through Rabbi Michael Schudrich, Chief Rabbi of Poland. if you are interested in participating, please contact me. Prior to my leaving for Poland last year, Professor Bertram had a woman who was also a survivor of Dubiecko, Frieda Steiglitz, get in touch with me to give me her insights. She, as it turns out, was related to a family which is one of my family’s very close friends. She has alerted me that there was a “little Torah from Dubiecko in a museum in Dynow.” Well- there is no museum in Dynow, but a small display area in the town library which was, at one time, one of the towns synagogues. There was, in fact, a Torah on display in a somewhat crude, but adequate glass and wooden case. Displayed by clearly well-intentioned, but non-knowledgeable individuals, it was place upside down in the case. A section of parchment had been cut out of either this, or another scroll, by someone who clearly did know something, as it was the verses containing the Shema. After some researching this past time in Poland, we have arrived at the solution to where the Torah came from. It was witnessed and known that all the Torah scrolls in the B’tai Midrash of both Dynow and Dubiecko were burned. There was, however, a small “kloyz” or prayer hall, which was unmarked externally as a synagogue and escaped destruction in the same manner. It appears that someone removed the Torah from the kloyz and possibly took it with him to Dynow when the Germans invaded in September 1939. The good news for Jews from Dubiecko, however, is that the Torah is coming out of the library in Dynow. It is being brought to the United States by Rabbi Michael Schudrich and I will be having it inspected by a sofer and possible repaired. My father will be able to reconnect with this piece of his past. My students will have the opportunity to learn about the community and the Torah that once nourished it. Then, I will be bringing it back to Poland to Rabbi Schudrich to be reconnected with a living Jewish community again in Poland. I will try to keep you all alerted to the Travels of the Torah as the plans evolve. of Poland, Rabbi Michael Schudrich, other musical recording people and Yad VaShem. But, I need the voices and names of the remnants of Dubiecko's Jews from prior to 1939. I know of only 4- my dad, Milton Frant, my cousin Binyamin Eichner, Frieda Steiglitz of Brooklyn, and the great uncle of Tomer Bruner in Israel - Mr. Raps. The mission is to honor the memories and accomplishments of the Jewish community of Dubiecko, Poland 72 years after their demise at the hands of the Nazis and their collaborators, through the re-creation of their original music, marking the sites where they performed, worshipped, and perished, and through the creation of an audio-visual record of these events. To reconstruct the music of the Frand Klezmorim of Dubiecko using the original manuscripts of their music for contemporary instruction and performance. To identify significant landmarks of Jewish Dubiecko present before September 1939 for placing of markers for historical record. To create a monument to mark and memorialize the mass grave in the Jewish cemetery of Dubiecko. To create inscriptions on markers to be placed on the walls of the Jewish cemetery to replace the grave stones removed by the Nazis to pave the road to the San River. To create a fund to assure maintenance of Jewish sites and cemetery in the town of Dubiecko. To create a video record of the events of this project by October 2010 as an anniversary production of the initial attack, destruction, and burning of Jews, their homes, and places / items used for worship. To create a recorded musical work for distribution to perpetuate the memories of the musicians of Dubiecko and to provide a new audience for their works and the works inspired by them. To coordinate with Rabbi Michael Schudrich the return of the Dubiecko Torah to the Jews of Dubiecko for restoration and ultimate return to the Polish Jewish community from the municipal library in Dynow. Find and locate the Dubiecko "remnants" for interview, for names to get placed onto memorial stones in the cemetery, and to get information as much as possible, on specific locations of cultural, religious, and socially relevant sites to be identified with markers in the town. Find out if any of the above are interested or able to participate in a memorial program in Dubiecko in the next year. My goal is to get any "survivors" first class air and ground transportation along with identified caregiver /family members. I know how rough this trip is! To see if there is anyone out there who would be a willing worker, not just a name on a list, to make this all happen. I am not asking for money, however. I am looking for outside funding sources. I hope you feel as I do that these are the days that we must seize to get the world to remember as these remnants of the Lost communities are rapidly disappearing from our lives. Thanks for your anticipated help with this effort. It is moving quickly with such credible peole like Hankus Netsky of the Klezmer Conservatory Band and musicologist of the National Yiddish Archives, Sam Glaser- international Jewish music performer and recording artist, Rabbi Michael Schudrich, and Avi Markovitz from Yad VaShem on board. But the linch-pin to me are the people, and I am hoping you can assist me with that piece of the puzzle. A remarkable event is going to happen in Dubiecko, Poland that all community members as well as the descendents of Dubiecko Jews will want to know about and plan on attending. On June 24th, 2010 under the auspices of the Chief Rabbi of Poland, Rabbi Michael Schudrich, the Jewish cemetery in Dubiecko will be re-dedicated. The Foundation for the Preservation of Jewish Heritage in Poland will be taking over maintenance of the cemetery and has a dedicated fund for grounds maintenance into the future! The date selected is not by chance. On June 24, 1943, the first of three major mass execution of the few remaining Jews of Dubiecko who had returned from exile in Russia or the Przemysl ghetto took place. A marker will be placed in the cemetery to commemorate that sad occasion as well as those that both preceded and followed it later. A plaque is also going to be placed by ceremony in the town center to acknowledge the Jewish historic presence in Dubiecko as well as the sad demise of that once vibrant community. A museum exhibit of large format reproductions of historic photos and artifacts of the Jewish community of Dubiecko will be on display. We are attempting to have a program of other cultural activities, including the local klezmer music from Dubiecko’s Jewish community if the arrangements can be made. For those interested in attending, there are rooms that can be booked right in Dubiecko at the Krasicki Castle (its new!) that has lovely suites, restaurants, and bars. I will be meeting during the week of the event with community leaders, school administrators and teachers, and religious leaders to develop a scholarship fund for local Dubiecko youth who study about the pre-war Jewish community in Dubiecko and create an essay or piece of artwork about Jewish life in Dubiecko, righteous gentiles who saved Jews in the town, or do commemorative work.